I've been suffering from a persistent case of writer's block. And worse, rider's block. Over the past two weeks I have finally climbed out of the emotional hole I tumbled into last fall. True, it has been a very difficult year. But the numerous posts I started and didn't publish, tended towards whining, complaining and excuses. So tedious and boring. And riding started to feel like a chore too. An obligation. It's a funny thing, how much good riding and good writing have in common. Self discipline for instance. Not being afraid to make mistakes. Attention to detail. How it's usually a good idea to have a plan before you start. Intention. Anyone can learn the rules of writing, but without something to say, without that spark - it's just an exercise in form. Many people can hop on a horse and go, but to get on the same page with one, to speak the same language, I think most of us need instruction. I don't want to get in the habit of phoning it in... at the keyboard or in the saddle. And I do want riding to bring me joy. So that's what I've been struggling with. In the course of keeping up with my favorite blogs, I've been struck by some fine writing about some fine horsemanship. They've inspired me to organize my life so I look forward to writing about it. Inspired to make the sacrifices that will allow me to progress with my riding. Exciting news to come on that front - save this space. I can't wait to hear the exciting news! And I totally feel you on the horse/writing front. I try as best as I can to stay positive but sometimes it just really gets me down. You are right, there is a light at the end of the tunnel and it is marvelous! We all have periods like that. Can't wait to hear . . . Appreciated your comments over on Equestrian Ink, by the way - I've decided not to comment over there any more as it's just a waste of my time - her readers aren't interested in anything I have to say and the whole thing just makes me sad. Good to hear you're finally coming out of the rider's/writer's funk you've been dealing with. Can't wait to hear how things are going with you and Val. Love your pictures. Happy, exciting news of growth and promise. Writing and riding. Forever tied together in this blogging world of ours. 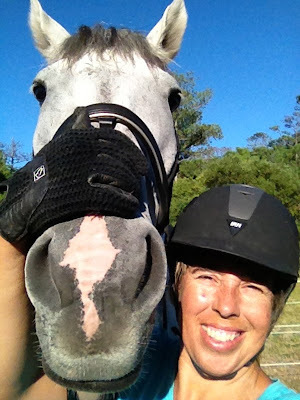 I've found a way to make riding simple for myself, but writing - ugh. Writing might be easier if I could do it outside. So glad you are finding your way out. Probably the visual artist in us stumbles around with words. Words are tricky ones. Your photos are lovely - and meaningful. Your time with Val caught forever. Looking forward to future posts. 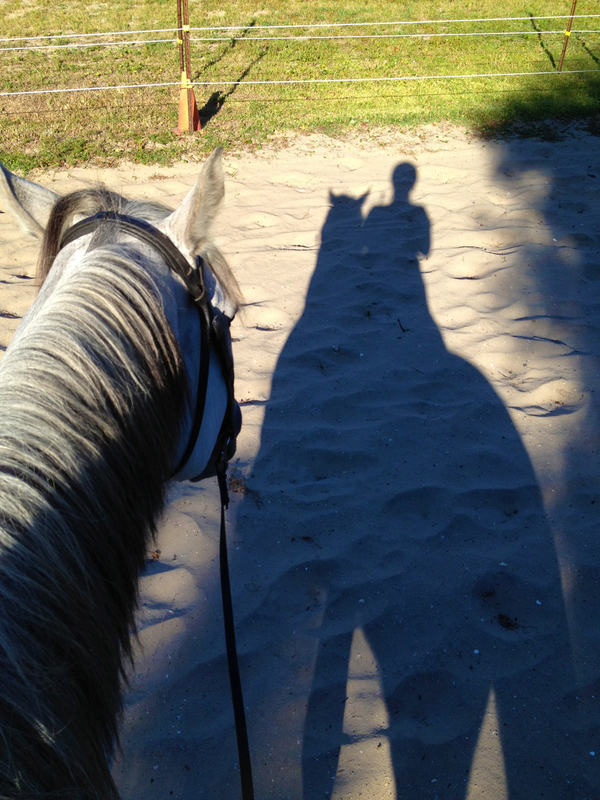 Sometimes taking a little break brings the spark back to riding -- and writing. Ooooh sounds intriguing!! Can't wait! You're allowed to share whatever you want, whining or otherwise. :0) I hope your saddle time brings you at least some joy and feelings of success. If not, try something else!